One of the big issues expected to garner much attention during this campaign season is what the future holds for the possible extension of SR-55, (Newport Blvd.) from it's current terminus at 19th Street in Costa Mesa to the Newport Beach city limits. 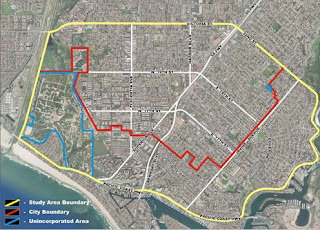 This issue has been studied by the city, CalTrans and the Orange County Transportation Authority (OCTA) for months, with public workshops being held in both Costa Mesa and Newport Beach to gather input from members of the community and officials. The next step in this process is a presentation before both city councils in study sessions by OCTA and CalTrans. The first of these presentations will be in Costa Mesa at the regularly-scheduled study session to be held on Tuesday, September 9, 2008. Because of the extraordinarily large turnout anticipated, this study session will be held at the Neighborhood Community Center at Lions Park. The meeting will commence at 4:30, with the SR-55 presentation anticipated to commence around 5:00. This will not be the kind of meeting folks have experienced in the past, with unlimited opportunities for comment, questions and criticism. This presentation is, according to City Manager Allan Roeder at the City Council meeting last night, simply a presentation to the city leaders of the distillation of the process so far, showing the choices currently under consideration. Don't show up next Tuesday expecting unlimited access to the parties involved - it won't happen. Roeder anticipates that the involved parties - the consultant, CalTrans, OCTA and the city, will host subsequent workshops so residents will have the opportunity for extended dialogue on this very important issue. The second of these study sessions will be held at the Newport Beach City Hall on Tuesday, 9/23/08 at 4:00 p.m.
MORE TH REATS FROM "THE MOUTH"
Sadly, we feel obliged to mention that The Mouth from Mesa North is at it again. He's embarked on another campaign of threats and intimidation against those of us who speak out against him. Yesterday, in his blog entry #474, he amended his original post to make it clear that he will soon stop "pulling punches". Now, that could mean many things, but his history is that of a thug and bully, so it's hard to know what to expect. In typical Mensa Marty fashion, he looks down his nose at those of us who dare to disagree with him and criticizes our every move. It must be very frustrating for him to think he's the smartest guy in the room, yet he fails to win the debate of important issues over such sub-humans as those of us who challenge him. It brings to mind the perpetually inept Chris Steel, whom he managed to get elected to the City Council nearly a decade ago. Old Chris - he's my age so I can call him that - was not the brightest bulb, but he was smart enough to recognize that The Mouth was trying to manipulate him. Chris rejected him and it made The Mouth furious - an emotion he displayed time after time at the podium as he and Steel would spit venom at each other in a low water mark for our municipal governance that stands today. He eventually managed to get Steel un-elected - something he's proudly crowed about when he attempts to knock his chosen candidates back into line. So, we sit here, shivering in our collective boots, waiting for him to quit pulling his punches - whatever that means - and will continue to comment on his lame attempts to swing voters his way. We'll comment when he attempts to sandbag new candidates that pose a threat to the stranglehold his chosen "improvers" have on the city today. As smart as he purports to be, his tactics and motives are laughably transparent. Somewhere along the line - maybe in a month or so - we'll give our views of the candidates running for City Council this year. He's already picked his crew. We're willing to let this cycle run a little longer, to give the newbies a chance to get up to speed and demonstrate they are worthy of serious consideration. The men he's supporting are known quantities. Their strengths and weaknesses have been demonstrated for several years. We have their past actions and motivations to examine. In the meantime, expect only the worst from The Mouth From Mesa North. Expect him to yowl and puff, yelp and pontificate on every issue and - above all - expect him to attempt to demean those of us who disagree with him. The fact that his right-wing essays have won favor with David Duke, the former honcho of the KKK, should be a good starting place to evaluate this guy's true core beliefs. Even more telling is that he uses that Duke praise as a marketing tool to try to sell his inconsequential books. Pardon me while I fight back my gag reflex! My favorite part of CMPress is the Junior High School name calling that he constantly resorts to along with his unflattering analysis of the physical characteristics of anyone he is trying to disparage. Why do you think he obsesses about peoples physical characteristics so? Oh, right, he is ever vigilant against the encroachment of the “every brown man” he so fears is going to overrun his precious DNA. I find it even more entertaining when he goes after someone who is generally in the Mansoor-Bever-Leece-Righeimer-Monahan-Rohrbacher fold when they should stray slightly outside of the bounds he so vehemently defines. Very odd and obviously frustrated little man indeed; but from an entertainment perspective you could cast a more perfect City Council gadfly if you tried! The whole anon issue makes us laugh, i mean this guy comes down on anon issues yet is tied to a lame who used to run around with a white sheet on his head until he was outed. I sincerely wished that this election, with big names and the associated money, could focus on the actual issues and avoid the mud-slinging. "Flopsy Foley" tells us NOTHING about what specific actions she has taken that CM Press alleges postpone the improvement of Costa Mesa. Millard obviously cares about Costa Mesa - enough to expend considerable time, energy and effort promoting his views while attacking those he opposes. Hopefully, as the election draws closer, he will use his intellect to analyze and inform. His response to McEvoy's website was a step in the right direction - no insults, no belittling, just a clearly articulated rebuttal. Let's see more of that from everyone. Agree or disagree - he made his point without baseless personal attacks. In my opinion, he would be MUCH more effective if he dropped the silly stories and petty insults and dealt with criticism factually. This election is important, and Costa Mesa is at a critical juncture in its history. We have Westside revitalization/redevelopment, the SR55 terminus issue, budget problems tied to a down economy and depressed home values, a resurgent gang problem and desperate need for more playing fields. Banning Ranch looms large - sticking our heads in the sand and wishing REALLY hard that it won't be developed won't get us anywhere. Mitigating the traffic impacts and maximizing the benefits from upgraded infrastructure, parks, schools and open space are where we should focus our efforts. Remember - Newport Beach is in the driver's seat regarding Banning Ranch. While we have some challenges, we are also on the verge of major acheivements and improvements to our city as a whole. This election will either result in bold stewardship of an improved Costa Mesa for ALL RESIDENTS, or stagnation and infighting. Identifying candidates who can get us there is our job - and cheap shots don't inform, they just make the shooter look petulant and frustrated. I look forward to your analysis of the candidates, Geoff. Rob, thanks for the clear articulation of your views. As always, they are appreciated here. Yes, it would be nice to have a debate on the issues without the vitriol. That doesn't seem to be in the cards, though. I suspect the presentation by OCTA and others at Tuesday's study session will generate more debate on the SR-55 issue. In a perfect world, one of the potential solutions would solve the traffic problems without destroying the "downtown" area. I look forward to their solutions. I'm at least a month away from presenting my views on the candidates. I want to see more of them at forums, and hear their views of the issues articulated. The way it's looking now, there will still be forums going on until the middle of October - maybe even later. So far, some of the new folks have impressed me with their willingness to do homework to get up to speed on issues. Some others have disappointed me with their slow start. I expect big bucks to be thrown into the race - mainly by Righeimer, Monahan and Bever - to try to head off any possibility of a newbie taking a chunk of voters from them. We'll see.. Thanks, again, for your participation.